An eternal flame, similar to the one near the Arc de Triomphe in Paris, will be installed on the War Memorial roundabout in Floriana, which is currently undergoing heavy pruning and embellishment works. 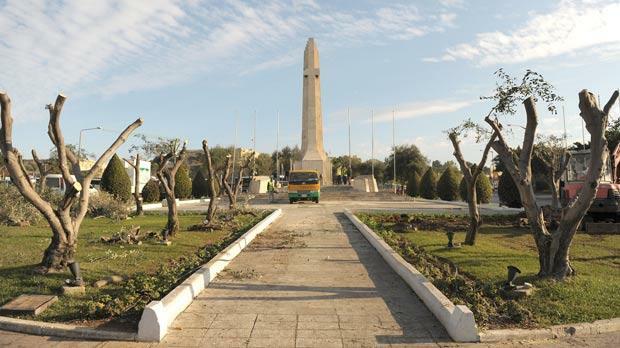 Just like the Arc de Triomphe – that honours those who died for France during the Revolutionary and Napoleonic Wars – the Floriana War Memorial was erected in memory of soldiers who lost their lives during battle. The war memorial in Floriana was built shortly after the end of World War One. After the Second World War, it was dismantled and moved a few metres, to align it with the re-developed St Anne Street. Commemorative plaques related to World War II were also added to it. Motorists driving into Valletta will soon be able to see the gas-burning flame that will be on 24 hours a day, explained Dean Grant from the Environmental Landscape Consortium that is overseeing the landscaping in the area. People driving through the area yesterday were shocked to see that several mature olive trees, on the Floriana side of the roundabout, had been heavily pruned in preparation for their uprooting. Olive trees on the Valletta side will remain and several other tree species will be planted on the roundabout. The uprooted olive trees will be replanted in other locations, Mr Grant said, adding that the olive trees were being removed to increase visibility of the War Memorial. Mr Grant added that the memorial itself was being restored which was why scaffolding had been set up in the area. Works would also have to be carried out to install the gas storage tank for the eternal flame.